If you want to read that headline again, take a look at the 2018 Authors Guild report. The report makes for difficult reading for all authors. The Guardian wrote regarding the author survey report. The Authors Guild reported that the median income from writing-related work fell to a historic low in 2017 at $6,080 (£4,760), down 42% from 2009. “When you impoverish a nation’s authors, you impoverish its readers,” said Authors Guild president James Gleick. According to Codex’s November 2018 National Book Buyer survey, Amazon owns 72% of the online retail book market. It means that book publishing and especially self-publishing is at the mercy of Amazon. However, the one bright point in the survey was for self-published writers. They were the only group to experience a significant increase in earnings – up 95% in book-related income between 2013 and 2017, with the number of authors self-publishing up by 72% since 2013. 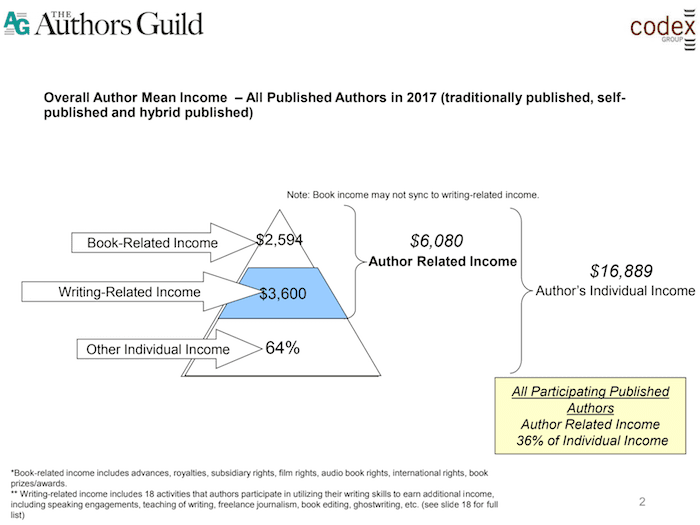 But the Guild pointed out that self-published authors still earned 58% less than traditionally published authors in 2017. For a published author, book-related income is on average only 36% of total annual income according to the earnings report. It means that for full-time published authors, and even successful authors, it is increasingly difficult to make a living directly from book and ebook sales. The Authors Guild blames the crisis on the growing dominance of Amazon, which it said forced publishers to accept narrower margins and then pass their losses on to authors. Another contributing factor is the growth of online subscription programs like Kindle Unlimited, which has over two million subscribers. It draws in the big genre fiction readers and results in them buying fewer books. If you write books, what can you do to increase book sales? If you are self-publishing books, the findings from this report are probably not a surprise. The fact is that there are so many Kindle ebooks being published that it is hard to make an impression. Between 2014 and 2018, the total number of Kindle ebooks grew from 3 million to 6 million. It means that 750,000 books were published every 12 months between the two dates. The number equates to one new book every one minute and forty-two seconds. If you want to compete in this crowded market, you need to understand how Amazon and to a lesser extent, other online book retailers work. You need to adapt and learn how to leverage digital book marketing to your best advantage in today’s publishing industry. Here are four tips to help you. How you list your book on Amazon and other retailers is a vital step that many new self-publishing authors fail to understand and use to their advantage. Very few book sales come from direct means such as Facebook, Twitter and blog posts. By far, most sales are generated from book buyers searching Amazon for a new book to read. So you need to find search terms that these readers use. When you can do this, your chances of gaining sales will improve dramatically. To gain daily and monthly sales as in the chart above, books need to be listed in niche categories as opposed to broad categories. Here are the categories for the first book in the list above. You can see that even though these books are clearly in the romance genre, the selected categories are much narrower. It is not possible to access the keywords used in association with books on Amazon. However, it is possible to do some analysis of keyword phrases that real book buyers use. The series of books by this author is described as both historical romance and regency romance. So which one is more popular with book buyers. While historical returns more searches, adding regency keywords expands the reach of this author. Researching your two listing categories and seven search keywords is the best place to start to improve your book sales. It is possible to research Amazon categories and keywords for free. However, the most effective way is to access real-time data directly from Amazon. I have used KDP Rocket to access the Amazon data listed above. For Indie authors, metadata is contained in your Amazon Author Central Page. Every element you add increases the possibility of your book, book description or editorial reviews being discovered by book buyers. You should read our in-depth article on how you can use and improve your Amazon Author Central Author Page. A well-built page can include your social media links, a follow button for readers and your blog feed. You can also add editorial book reviews and more book descriptions that are linked as back cover and inside flaps. Amazon shares all of this additional information on your book’s sales page in all Amazon stores. On the author page, there is a new element listing author rank for genre categories. I view a lot of books on Amazon, and it is surprising how many authors don’t bother to set up an Amazon Author page. If you don’t have one, or you have not updated it in a long while, optimising your author page should be the first thing you can do to help sell books. There is no doubt that you need some forms of book promotion. However, they should all be in addition to well-selected genre categories, keywords and extensive metadata. A blog is a good vehicle, but you do need to post new articles regularly to keep your readers and attract new ones. Social media can be a big time waster. It is easy, but it is a short-lived promotion. If you are not posting extremely regularly, the benefits are few and far between. Having a social media presence helps a little. Sure, have a Facebook page and a Twitter account. But if you value your time, you might consider outsourcing your social media postings. Our sister site, Whizbuzz Books, offers one year of social media book promotion for only $49.00. You can read the FAQs for more detailed information. In the headline of this article, I wrote that 25% of authors earned zero income in 2017. I would guess that the majority of these authors self-published a book or an ebook on Amazon, Smashwords or Draft2Digital, and thought that their work was done and that sales would roll in. It doesn’t work like that. Hitting the KDP publish button is not a magical way to make money for free. The only way to make money as a self-publishing author is to work hard at getting all the basics right and invest in the tools you will need to give yourself the best chance at achieving some success. The expression that the harder you work, the luckier you get, is true for authors today. The Author Guild report might give the impression of gloom and doom for authors in general. But for self-publishing authors, the news is not so bad at all. However, you have to accept that the return per copy sold is slim, especially at today’s price point for ebooks. So you need a lot of sales to generate a reliable, and liveable annual income. Learning to leverage the tools that you need to use to make your book more discoverable amongst the millions of books on Amazon and Kindle Unlimited is the only route to take. So forget telling your Facebook friends and Twitter followers to buy your book. Instead, make your books much more discoverable where there are book buyers buying books every day. Related reading: What Defines Good Books To Read For Real Book Buyers? Just to play devil’s advocate, back in the days of traditional publishing the royalties per copy were miniscule compared to Kindle payment rates. 50p a book was considered high! Yes, the writing is easy in comparison to what comes after. Thank you for this post.